Description: This beautiful quality crafted glass ornament in frosted white, features an exterior photo of the snow-covered Basilica of St. Mary of the Assumption at Christmas time. Surprise grandma, grandpa, mom, dad, any family member or friend this Christmas season with our exclusive 2018 ornament; our sixth basilica ornament in a yearly collection. Don’t forget to order one for yourself. Dimensions & Specifications: Glass ornament measures 3 ¼” diameter; full color photo, with blue lettering on second side; Presented in a display box, making it ready for gift-giving and providing protective storage year after year. 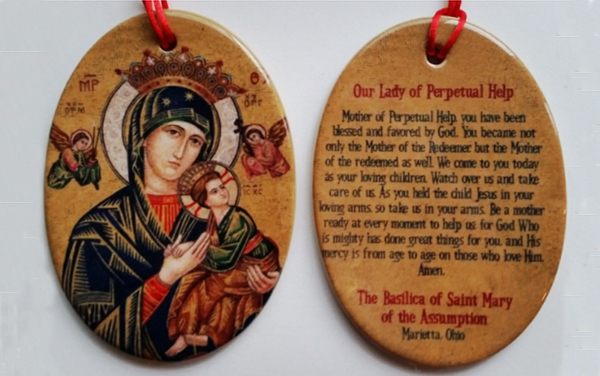 Description: Our Lady of Perpetual Help oval ornament — a mosaic from the Basilica of Saint Mary of the Assumption is a beautiful representation of the Blessed Virgin Mary and infant Jesus in the Catholic Tradition. On the reverse is a prayer to Our Lady. The ornament is made of high-quality bisque porcelain. It includes a red ribbon for hanging and comes in a clear gift box. Description: This beautiful quality crafted glass ornament in flame red, features the Nativity scene commemorating the Birth of Jesus. The photo is from the basilica manger. 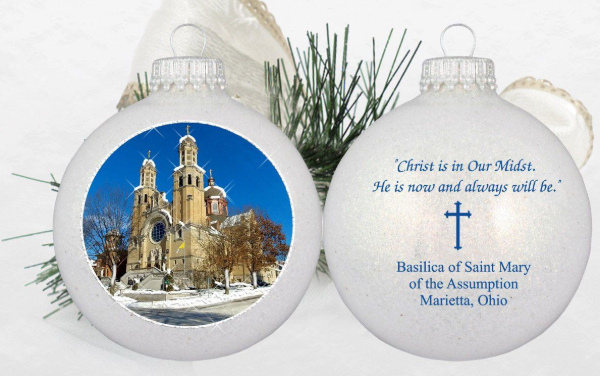 Surprise grandma, grandpa, mom, dad, any family member or friend this Christmas season with our exclusive 2016 ornament; our fourth basilica ornament in a yearly collection. Don’t forget to order one for yourself. Dimensions & Specifications: Glass ornament measures 3 ¼” diameter; Photo featured on full-color silk, with gold lettering on the second side; Presented in a display box, making it ready for gift-giving and providing protective storage year after year. 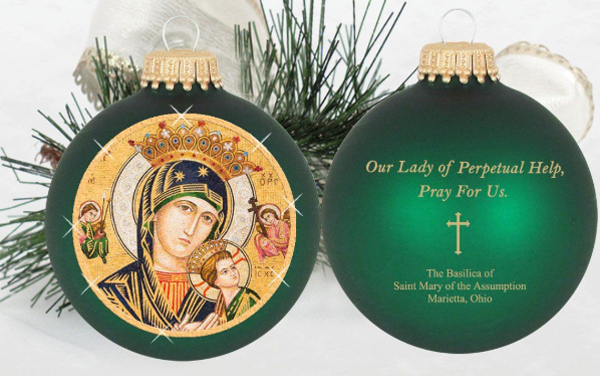 Description: This beautiful quality crafted glass ornament in velvet green, features the beautiful basilica mosaic of Our Lady of Perpetual Help. Surprise grandma, grandpa, mom, dad, any family member or friend this Christmas season with our exclusive 2017 ornament; our fifth basilica ornament in a yearly collection. Don’t forget to order one for yourself. 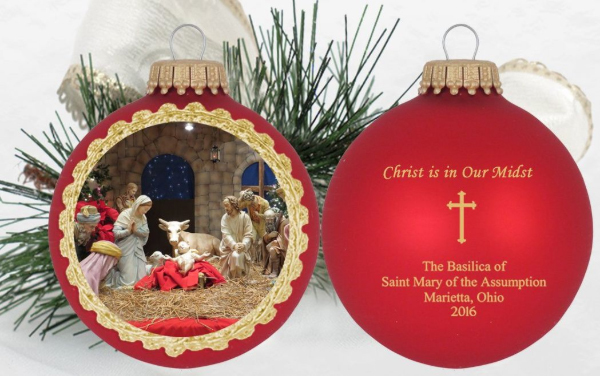 Dimensions & Specifications: Glass ornament measures 3 ¼” diameter; Full-color photo with gold lettering on the backside; Presented in a display box, making it ready for gift-giving and providing protective storage year after year. Description: Pairing favorite Catholic images with a textured tile surface creates a unique way to display this art as home décor. Each finely detailed tile can be hung on the wall or placed on the wire stand. With artwork by Michael Adams,this is sure to be a treasured piece for generations. 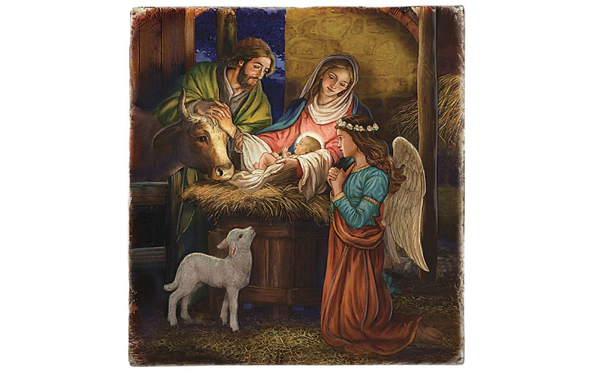 Description: The perfect Catholic Christmas Card for you to send this year. 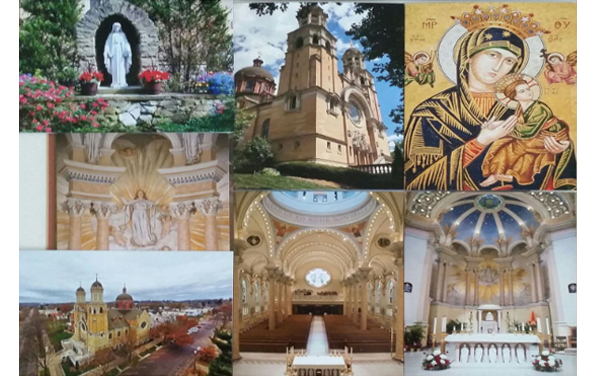 A collection of 12 cards 5” x 7” depicting the stained glass windows of St. Mary of the Assumption Basilica. 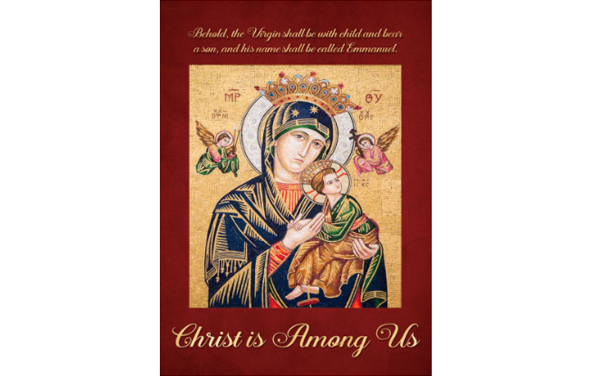 These beautiful religious cards send the joyful message of Christ’s birth to your family and friends, and the perfect way to send Christmas and New Year greetings. Cards come with a white envelope for mailing or gift giving. Dimensions &Specifications: 5” x 7”, 12 cards per box. Cards not sold separately.